One of the most rewarding relationships in my life so far was the wonderful relationship that I had with my "Little Sister" Ashley. I had seen the wonderful experience my younger brother Joe had with his "Big Brother" as a child and I wanted to give the same experience to another child. 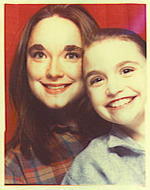 Ashley and I became Little and Big in 1997 and we had a wonderful year with one another. I was 21 and she was 7. We were the perfect "match". We had very similar personalities and likes/dislikes, we even resembled one another. We often got mistaken for "real" siblings and on rare occasion people thought I was her MOTHER!!!!!!!!!!!!!!!! Um, no, can't say I had a child at 14. Click below for a few more BFTP pics! I feel a little weird and a little apprehensive about posting this week's BFTP picture. Ok, truth be told, I feel VERY weird and more than a little apprehensive to be posting it. But I am going to do it anyway. Sometimes it is a good thing to go outside your comfort level. It's not exactly the best quality picture of me (I am in a bowling alley and had no idea my picture was being taken by Kevin) but there's a story behind it so I am posting it anyway. It's been awhile since my last Blast from the Past so I thought it might be fun to do another one. For this week's BFTP I decided to focus on my wonderful relationship with my only "real" sibling. I have two older step siblings but only one full sibling. 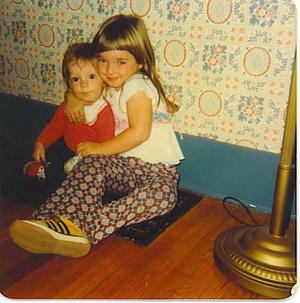 My younger brother Joe and I have ALWAYS been SO VERY CLOSE. I just can't imagine my life without him. We had our share of fights growing up, mainly him beating me up, but my god we were so close. Thankfully, we remain very close today. Even though we are three years apart, there are times when he feels like my twin because we ARE so close. I am so thankful to have him in my life and it is so amazing to see him as "Uncle Joe" to Nathan and Austin and soon to be Haley. For several years it was just me, my brother, and my mom. The three of us. The three of us are so close and we are an incredibly affectionate family. We say "I love you" all the time, like non stop, and we are never afraid to talk about our innermost feelings with one another. Me at 3 again with oh sooooooo lovely pants and shoes. Thanks Mom! LOL! I know you all are mad jealous of my pants and shoes! Just admit it! Click BELOW for MORE Blast from the Past pictures! As always click on any image to ENLARGE. This week I am combining Tuesday Treasure with Blast from the Past.Oh my it's been a long long time since I posted a Blast from the Past. This week I have been thinking a lot about my college days at Illinois State University. Ann and Jessica were two of my suite mates. I will always always ALWAYS treasure my days at ISU. On Saturday we will be driving to my roommate's house for her daughter's 3rd birthday party (she lives about two hours away). My how time flies. Amy and I have been friends for about 22 years now. So hard to believe. When I think about my childhood, I think about her. We had a lot of good times while rooming together. 1996 and 1997 were two of the best years of my life. 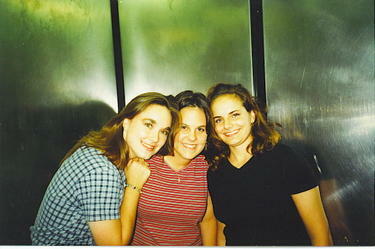 Those were the years that I was at ISU, the rest of my college years were elsewhere. So carefree (well besides finals, papers, being broke lol). So fun. So independent. So everything. They were THE BEST. It's so hard to believe that college was TEN YEARS AGO and now I am happily married with a 4 and a 2 year old with one on the way. She is married with a 3 and a 2 year old. Five days after becoming a mother for the very first time. I had never seen anything so beautiful or precious in all my life. God willing, I will hold our third baby, in 7.5 months. On a side note, I should be arrested for wearing that shirt. OMG. I am seriously lucky that the fashion police didn't lock me up for a minimum of 30 years for that illegal activity. If I remember correctly, I was wearing my "bad" clothes so I wouldn't ruin my "good" clothes with breast milk stains (waste of time on the whole clothes thing, the bm never did come in. I am a freak of nature). And let's be honest, I was five days post partum and still recovering from my unexpected c section, I DID NOT CARE WHAT THE HELL I WAS WEARING! Just as long as I was wearing something, anything. Me TOTALLY naked these days, not a good thing. lol. I was definitely a mom for the very first time. "You and me and LOVE!" while giving me the BIGGEST hug and kiss EVER. The boys are still sick with the stomach virus so we've been lying low this weekend, have to. I did get out of the house yesterday, FINALLY!!!!!!! !, after a very long and hard week of being housebound. OMG did it feel good to be out of the house. I enjoyed dinner at Applebee's and the movie Eight Below with my mom. I highly recommend the movie. Paul Walker is F I N E. Fine I tell ya. And the movie is amazing. The food I highly recommend too HA HA! Anyway back to the point of this entry, I was looking for something on our computer yesterday and ran across some old favorite pictures of mine of Nathan as a baby. I had SO MUCH FUN posting this picture entry of Nathan that I thought why not post these pictures since none of you could have even started reading us until Nathan was at least 15 months old. That's when I finally got my iParenting Diary. Notice the drool hanging down from his chin?! *GRIN* Can you say TEETHING!?!?! As always click on any images to ENLARGE. And here is Nathan enjoying one of his VERY FAVORITE foods as a baby, good ol' sweet taters, he IS my boy after all. I LOVE LOVE LOVE sweet potatoes! Of course, NOW he wouldn't touch them if I paid him a million bucks. Here are a few short video clips taken with our old digital camera the same day as the first picture above. They are all of him first learning to walk. How can my boy who just turned three be turning FOUR in like 6 weeks?! How?! Download MVI_0039.AVI Oh my goodness my baby learning to walk! Download MVI_0042.AVI The cutest and funniest thing ever! The laugh. The growl. The HAIR OMG! And Nathan trying to go back to where he came from! LOL! Download MVI_0044.AVI CHUBBY CHEEKS GALORE! Download MVI_0045.AVI Somebody is a little tired of the whole learning to walk thing! Kids grow up far too fast. 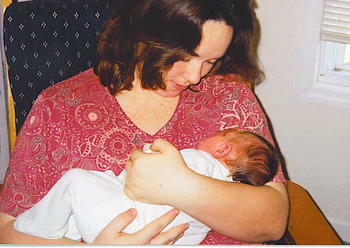 One last picture ....here is me with Nathan in utero at my baby shower. My friend Amy was always teasing me for my baby belly, teasing me in a good way, she loved my belly. She now has two kids of her own, a boy and a girl. And I of course have Nathan AND Austin now. I don't have much time today but wanted to post at least something, so I thought I would throw up a BFTP picture real quick this morning. This is me with my life long friend Amy, taken on the day of my surprise wedding shower, back in 1998. It ended up being one of the most special days of my entire life. 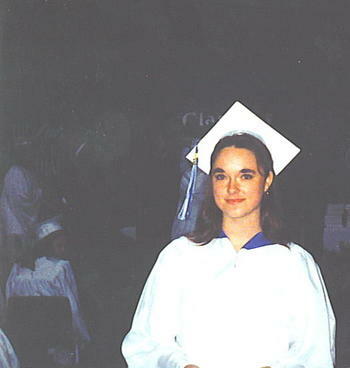 Me posing for my dad (step) at my high school graduation back in 1994. 12 YEARS AGO!? OMG! This was right after receiving my diploma on the stage. Click below for a couple more FAKE pictures! You will KNOW what I mean! 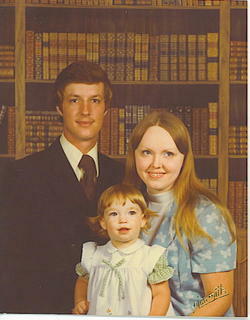 This picture of me and my parents sure makes me really really REALLY miss my dad. I can't believe he has been gone for ten long years. It doesn't seem possible. AT ALL. 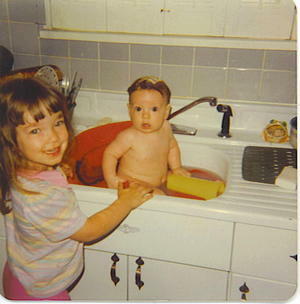 This was taken a year or two before my brother was born. I have no idea how old I am in this picture because my mom committed a picture sin by NOT writing the month or year on the back of the picture. I am guessing she has the same picture in a different size WITH the information on it but that doesn't help me tonight. HA HA! Any guesses as to how old I am in this picture? I am guessing right around 12 months but I could be way off on that one. I miss you dad. You were taken away from us way too early and way too young. I just wanted to wish all my FABULOUS blog readers a happy, healthy, and safe New Year! Gone are the days of this and this, tonight we will be hanging out as a family of four and there is a 50 50 chance we won't even be awake at midnight. We are SO COOL let me tell ya. So yeah even though we won't be able to go out and get all wild and crazy and we are much too old to skate anymore, well until our boys are old enough to go that is (that was SO my thing as a kid! ), it will be nice to just be home as a family. Runny noses included! Happy New Year! Have fun but not too much fun and have a drink for me! Click below if you want to see me on New Year's Eve back in 1993 as a 17 yr old! Aqua Net and Paris Sports Club and all! I told you guys how much I loved me some PSC back in the day!